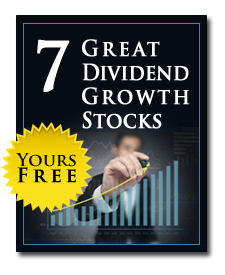 7 Great Dividend GrowthStocks to Buy Now! Forget about short-term market swings, President Trump’s latest tweet, or the news out of Europe and China. There’s one time-tested strategy that will deliver safe, growing income and 100%+ gains in the months and years ahead… no matter what happens next. Get the details in my latest report, including the names of my top 7 buys to start profiting today – free!